RBTH has compiled a list of Moscow restaurants where visitors are greeted not only by human proprietors but by four-legged hosts, too. The Ukrainian restaurant Shinok was opened by Andrei Dellos, the owner of the famous Café Pushkin, back in 1997. Since then it has been visited by numerous celebrities including Vivienne Westwood and the Rolling Stones. In 2013, the restaurant underwent a complete renovation: it now has an open kitchen and its interiors have been transformed. The only thing that remains unchanged is a large glass atrium in the middle of the restaurant, which houses a real cattle yard and a woman that tends the cattle. The restaurant is home to pheasants, peacocks, the rabbit Yasha and its star – the wavy-haired cow called Romashka. The animals adhere to a strict work schedule and therefore can be seen at the cattle atrium from nine in the morning until 10 in the evening. From Monday to Wednesday the grill house Funny Cabany operates as a regular restaurant, but on Thursday night into the weekend it turns into a venue for parties, often featuring various Moscow celebrities. 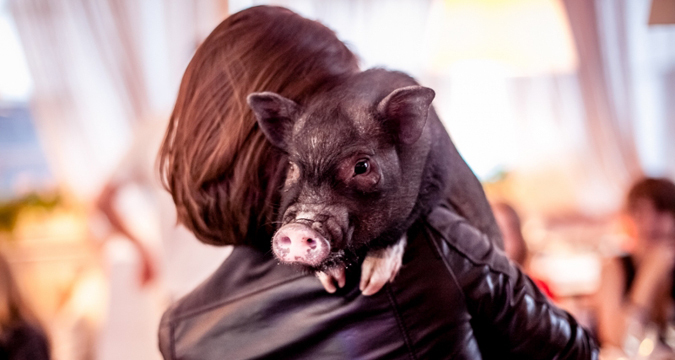 A fixture at every party is the four-legged “proprietor” of the place, a mini pig called Funny. It wanders around the restaurant (on a leash) and the restaurant’s frequent visitors often come just to cuddle with him. Funny likes to be photographed and is regularly featured in the restaurant’s newsletter. According to patrons, there is just one “problem” resulting from meeting the charming pig: after spending a few minutes with Funny, the idea of eating meat becomes unpalatable. The owners here have tried to turn this restaurant of Chinese and Japanese cuisine into a real Asian “island” in the heart of Moscow, not only in terms of the variety of dishes on the menu, but regarding the interior as well. In addition to the traditional furniture and objects that decorate the place, there is an artificial river flowing under the glass floor. Patrons can see live koi carps and red-eared sliders swimming there and they can check out mandarin ducks and a serious-looking Chinese pheasant on the bridges above the river. Guests can also get special fish from the waiters to feed the river’s inhabitants. The Georgian chain Khachapuri attracts visitors not only with their delicious traditional dishes like satsivi or lobio, but also with the possibility of meeting Moscow’s most outgoing ram, Tolik. Tolik is the symbol of the chain, a favorite with women and children, a fashion guru with an apartment of his own outside Moscow and a regular at chic parties around the city. To find out which of the Khachapuri restaurants Tolik will grace with his presence on a given day, you can check the chain’s website or Tolik’s social network accounts. The ram is present on Facebook, Instagram and VKontakte, where apart from everything else, he “posts” news about the restaurant and lists his favorite dishes. This is another Georgian restaurant that is fond of animals. Unlike the cosmopolitan charms of Khachapuri, Elardji recreates the atmosphere of a country house with home-cooked meals. And can you imagine a house in the country without animals? At dinnertime, visitors to the restaurant can enjoy the chirping of its resident birds, listen in to a conversation of two parrots and stroke the cat Anatoly. Additionally, there are squirrels and rabbits living in the courtyard. During summer they are joined by a cute she-goat, who whiles away her days munching grass in the yard. Quiz: How well do you know Russia?